Carnival Cruise Line is doubling down on its brand partnerships aboard its upcoming Carnival Horizon. Both Guy Fieri and Dr. Seuss are heading to the new ship in bigger ways than ever before. Previously, it was announced the line would dedicate more space to its in-house Bonsai Sushi dining venue by adding in Bonsai Teppanyaki on the Horizon. Now, it’s known that the brand will be putting even more muscle behind its outside collaborations too. 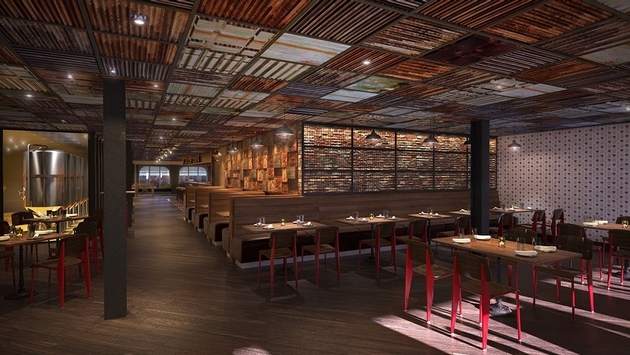 In order to introduce the expanded Guy’s Pig & Anchor Bar-B-Que Smokehouse|Brewhouse, the RedFrog Pub & Brewery found on the Carnival Vista sister-ship is being replaced. The line is essentially pulling back on one of its own properties in order to emphasize its growing collaboration with the celebrity chef. Although premium barbecue offerings will be featured here for a fee, the smokehouse’s buffet items will still be freely available along the promenade on embarkation and sea days. At least the poolside RedFrog Rum Bar will remain as will the beer-brewed-at-sea concept with Fieri’s brand at the helm. Similarly, Carnival’s partnership with Dr. Seuss Enterprises is expanding on the Horizon with even more children’s programming and a newly branded WaterWorks. “Be Kind/Dare to Care” activities in line with “Horton Hears a Who!” will be showcased on top of existing Seuss at Sea programming onboard the new ship as well as the fleet at large. Besides the Dr. Seuss Bookville kids facility, Dr. Seuss WaterWorks—exclusive to the Horizon—will bring even more of the literary properties to watery life. The previously unbranded aqua park will feature Cat in the Hat and Fun Things water slides. The first will display the red and white colors of the titular cat’s hat while the second will represent Thing 1 and Thing 2. An additional splash zone and Seuss characters will also be featured. All of this is to say that more hardware is being committed to outside brand collaborations on the Horizon than ever before. While Carnival is all about fun activities and software, additional hardware solidifies its dedication to such endeavors. With the Horizon being the same size as the Vista, some former venues have been altered to introduce new ones rather than others being simply added. Such is the case with the swapping and reconfiguration of The Library Bar and Piano Bar 88 to accommodate Bonsai Teppanyaki. Comparing the Horizon and Vista deck plans on the Carnival website shows that only the SkyRide and The Fun Shops have yet to be directly labeled with a location indicator. It is known that the suspended cycling coaster will be included onboard the new ship along with retail spaces. However, since they have not yet been pointed out specifically here, they could prove to be primed for future announcements. Might the SkyRide—itself an outside brand partnership—be further branded with another Carnival collaboration a la WaterWorks? Might one or more of the shops still make way for a new venue entirely? Among Carnival’s other collaborators to be considered for the SkyRide, for instance, is Hasbro. Imagine a Chutes and Ladders SkyRide or an even more interactive version combining the attraction with Bob It! to see how many points you can tally up before returning to the station. MSC Cruises is putting Slideboarding on its future MSC Seaside that combines a water slide with a video game, so this type of idea is entirely within the realm of possibility. What could be joining the retail stores, if anything, is also yet to be determined, but we will definitely keep you posted once we know. Jason Leppert  Senior Writer, Cruises and Cruise Travel  is a San Diego-based cruising expert with more than 100 sailings under his belt and a fresh, youthful perspective on the industry. He has been cruising since before he was two years old, thanks to his parents’ shared passion for traveling and their desire to experience all journeys together as a family. He is the founding editor of PopularCruising.com and producer of the successful Popular Cruising YouTube channel. He also contributes to the Travel Channel; Cruise Travel, Porthole and Lonely Planet magazines; Onboard.com; ShermansCruise.com; MiceChat.com and the Cruise Radio podcast.